Mark: The color(s) yellow, red, blue ,green, black is/are claimed as a feature of the mark. 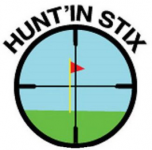 The mark consists of a yellow golf flag stick with a red flag with a blue sky and green earth background as seen through a black rifled scope sight cross hairs. The words HUNT’IN STIX appear above in a curved arch in black.